In an exciting update for the proximity market, Google recently announced Eddystone support on the Chrome browser for Android devices. Chrome for Android support will allow interaction with the Physical Web content, thus bringing seamless mobile experiences to the huge Android smartphone market. Let us trace back the evolution of the Physical Web. In October 2014, Google launched the UriBeacon project, to explore how BLE beacons can be leveraged to share URLs directly on the Chrome browser, installed on customers’ mobile phones. In July 2015, UriBeacon evolved into the Eddystone open beacon format. As part of this update, Eddystone extended its support to include two new payload types – Eddystone UID(unique ID) and Eddystone TLM (telemetry information), in addition to the existing Eddystone URL protocol. 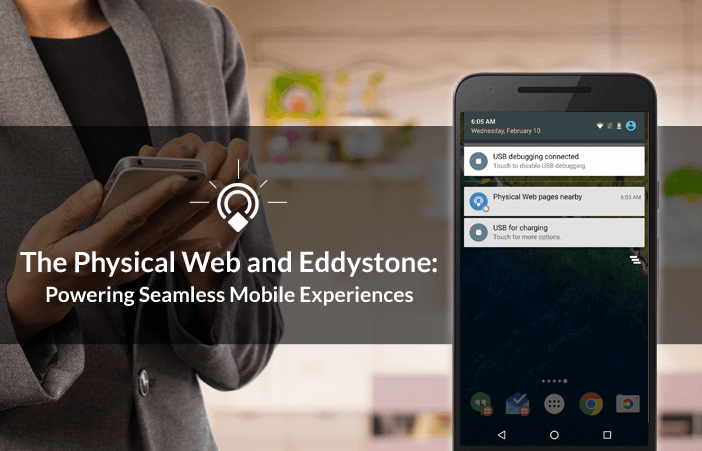 Now, with Eddystone support for both iOS and Android devices, Google aims at unleashing the core power of the Physical Web – interaction on demand. The purpose of the Physical web is to bridge the gap between the physical and virtual worlds by encouraging people to interact with physical objects or environments by automatically sending them relevant notifications/URLs on their smartphones. Thus, with the Physical Web, customers can simply use their smartphones to interact and view web content without the need for native mobile apps. – Vending machines – Serving customers at vending machines with relevant product information or even running contests. – Retail stores – Targeting customers who have not downloaded the store’s native app. The Physical Web simplifies customer interactions. Customers no longer have to search their phones to find and open the right app to access content in a mall, event, or airport. The Physical Web’s universal approach offers a progressive and alternative way to browse the web more easily and effectively. However, it should be noted that the Chrome app should be downloaded on customers’ phones for all interactions of the Physical Web. Proximity marketing through the Physical Web is relatively easy and cost effective, thus allowing even small retailers to explore proximity marketing. The solution is scalable since it removes the need for developing and maintaining an app (which can prove to be expensive). In addition, the Physical Web content (URLs) are inexpensive to create and administer. The Physical Web by nature is built to protect customers’ privacy and security needs. Customers can choose to be anonymous and browse URLs in incognito mode. Customers can be tracked by the Physical Web enabled apps when they opt in for it; they always have the option to opt out of providing personal data to the browser. 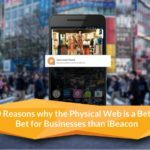 The operational costs involved in setting up beacons for the Physical Web is relatively low. No specific expertise is required to install the Physical Web beacons. To deploy the beacons, they just have to be placed near the product/area where the brand wants to push customer interaction. In addition, an existing beacon could be reassigned to new products/venues if needed. Practically no adjustment to an app, a map, or to a browser is required when Physical Web beacons are added, moved, or removed. Integrating your product with the Physical Web would create a channel for Google to access data about where your customers are and what kinds of Physical Web interactions they are connecting with (although Google promises not to share any personally identifiable information from customers’ devices’). Customer engagement driven by a beacon-enabled app is known to be highly effective. Beacon-enabled apps are capable of delivering highly targeted content to customers and they gather deep insights around customer preferences. The extent of customer targeting and data capture by the Physical Web is yet to be fully discovered. The Physical Web is another step in the direction of creating seamless customer interactions that emcompasses both the physical and virtual spaces. It is built upon the familiar, mature and powerful building blocks of the Web and as we move forward newer interactions and functionalities can be expected of the Physical Web. Proximity marketing tools for reaching customers today, has grown to provide both deep and wide solutions. Small brands now have the ability to deploy proximity solutions using the Physical Web, due to the lower costs involved. Alternatively, certain big brands may choose a combination of both approaches (beacon-enabled app and the Physical Web) to reach customers, thus allowing the brand to not only increase customer reach, but also effectively gather deep customer insights. In conclusion, brands have to clearly understand the underlying objective of deploying a proximity solution, be it iBeacon or the Physical Web and then go ahead by first deploying a pilot project.